Rangiri FM Radio Live Streaming Online . Listen Over 50 Sri Lanka FM Radio Stations Live Online . Enjoy Live Stream of Sri Lanka FM Online . Please wait for 30 Seconds to listen this station( Player loading may take 30 Seconds ) . Scroll down to see play pause and stop buttons. Rangiri FM is one of the most famous FM station in Sri Lanka . FM will start playing automatically . The First Buddhist Radio Channel in Sri Lanka . It is inaugurated with the intention of promoting the Buddhist cultural values and development of personality including aeasthetics values. Note: If you still cant listen radio Please click Contact Us button and we will get back to you soon . Make Sure you install all required plugins . All Stations plays well in Google Chrome or Mozilla browsers . 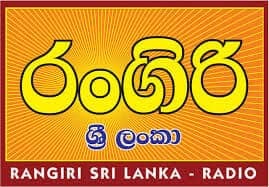 Address : Rangiri Sri Lanka Media Network , No.130 , Kandy Road , Dambulla .